Things gleaned from Pinterest. If you want more ideas, see organizing. Take one thought and do it, rather than acquire a hundred and think about it. 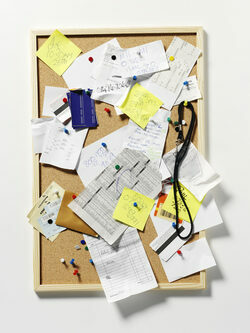 This is not how you should declutter---this is more why you should de-clutter. Clutter makes you feel poor. Who do you think of when you see clutter escaping a house’s seams? Certainly not the rich…you think dirt poor, not working, lazy people. Are you? 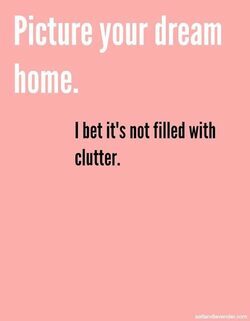 Of course not, so get rid of clutter. Clutter makes you buy more things. Know when stores sell more storage containers? Right after Christmas when you have more stuff to put away that you are not going to use. You can spend hours (I almost did) on pinterest. Finding ways to pack more things in less space. Why not have less things and more space? If there is no use, no feeling or no value, get rid of it. Broken electronic things? Unless you are one of my few readers who have geniuses for sons that can fix them (and have time to fix them), get rid of them. Clutter makes you feel depressed. I painted my wall behind my computer with magnetic paint (available at Lowes and able to be painted over with other colors, although it will lose some of its power). I can easily cut magnetic-stickers for using on business cards, to fit ideas, thoughts I must keep and find later, sayings that inspire, how-to’s about how to use my computer…Gets it off my desk, although I must de-clutter my wall regularly. How does a clean desk inspire you? Not sure that I would know…let me work on that one. Do you wish you could cook, but don’t have the counter space because it’s covered with clutter? By the time you find the counter, you’ve lost your incentive to bake? Do you spend more time trying to find something that should be right there, than doing the thing that you love? Do you spend more time cleaning things that you thought you liked, then liking things you have to clean? I’ve helped clean others’ houses. Walking around their piles of “junk” made me want to go home and take a shower and then throw out my stuff. You can’t hang onto junk and feel clean. If you spend your time looking for things that you should know where they are, you won’t have the energy to be nice to your children. They will get the brunt of your frazzled feelings. That gives sentimental value to it and makes it harder to throw it out. If you fill your eyes with stuff every day, your soul is on overload and can’t focus on God. Do you have a quiet space to talk with God? One great mother from the past would throw her apron over her head. Her children knew she was praying. I don’t have a big enough apron. But I do have a chair outside where I can hide for a few minutes to talk to my Savior. But when I look at the yard or the toys left out from the boys’ play, I get distracted from my prayers and I find they are not effective. Maybe that’s why I must also close my eyes. Or maybe that is cause to clean after my talk with Him. 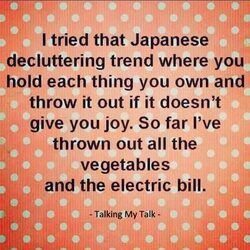 Most of my de-cluttering is refocusing.. I can give to others, when I know what I have to give. I can serve Him better, when I can have people over without cleaning for a week to prepare for them. See what I mean. Things don’t seem so important. People come into focus. Jesus didn’t come to save the earth, with all its stuff. In fact, this earth will some day burn up and be made new. Don’t add to the kindling by keeping everything. Jesus came for the people. De-clutter to know Jesus better. 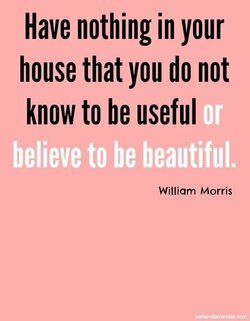 How do you get motivated to de-clutter?